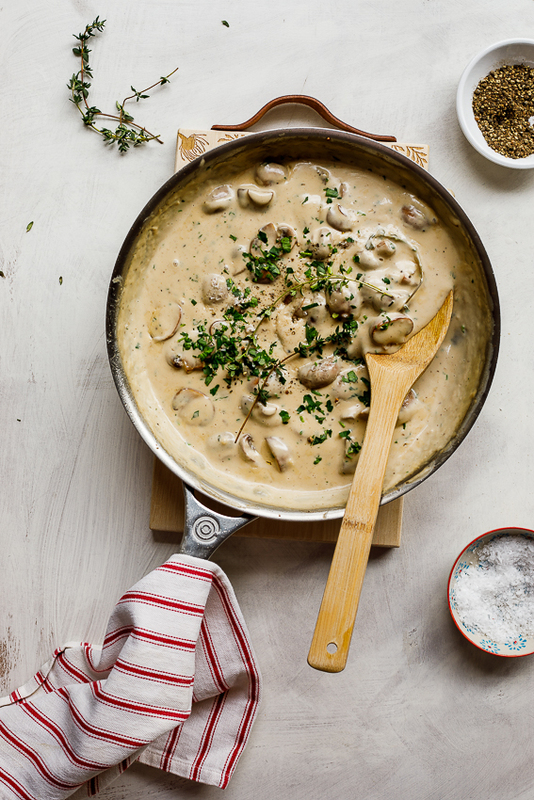 Every cook needs a good easy creamy mushroom sauce recipe. It’s perfect stirred through pasta and fantastic on grilled steak. When I was 14 years old I asked my mom if I could start cooking dinner for our family every now and then. She didn’t hesitate for a second to let me take the reigns while she went to settle on the couch with her book. I didn’t have a clue what to make but luckily my mom kept a pretty well-stocked fridge/freezer and I quickly settled on chicken schnitzel (which I still buy ready-made, FYI) drenched in creamy mushroom sauce, mashed potatoes and carrots. There was only one problem, I had no idea how to make mushroom sauce. My mom gave me direction from the couch but for the most part I was on my own. I chopped the garlic, sliced the mushrooms and added them to a hot pan with some oil. Fried them (for not nearly long enough) and poured in WAY too much cream. In went a slurry of milk and corn flour to thicken it all up and I seasoned it (again, not nearly enough). It was the first recipe I had ever made by myself. Over the years, I perfected (in my opinion) this very humble and simple recipe and can honestly say I make it at least once a week now. 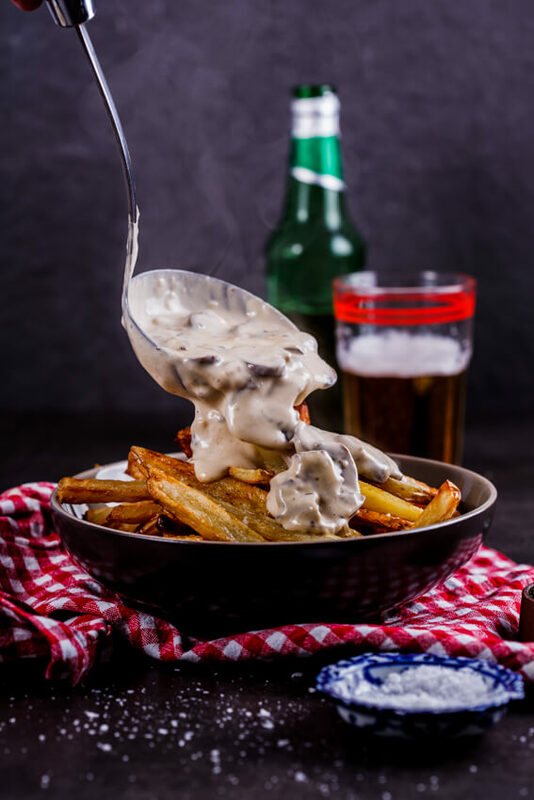 Whether I stir it into al dente pasta for a fast weeknight dinner, pour it over crispy oven-baked fries for a lazy weekend snack or serve it with medium-rare steak, we LOVE creamy mushroom sauce in our household. Feel free to play around with the flavourings but I honestly think thyme, garlic and lemon were all made for mushrooms. If you wanted to keep the sauce more on the low-cal side, substitute the cream for milk. Of course, the sauce won’t be as rich and luscious but it will still be delicious. And that’s really it. 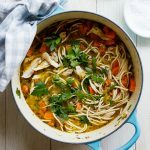 This recipe is SO easy and so simple but will quickly become a favourite in your home too. Guaranteed. 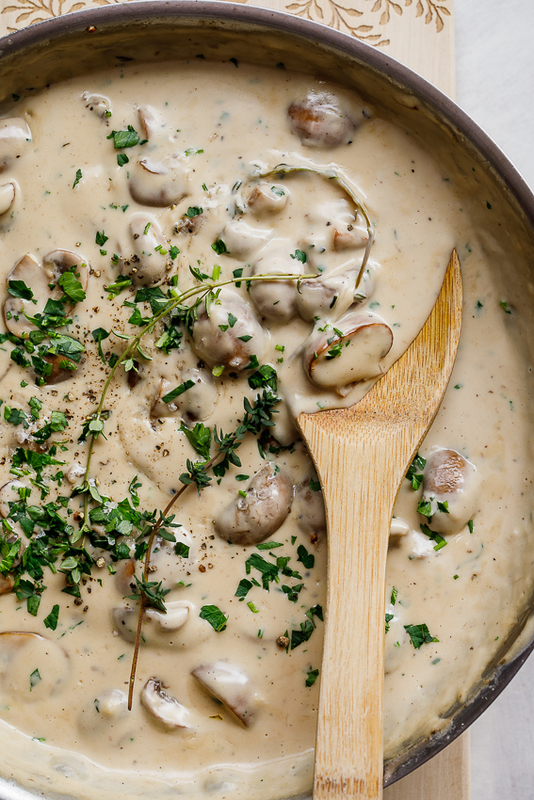 How do you make the best creamy mushroom sauce? Melt butter and olive oil together in a large frying pan then fry the mushrooms until they are golden brown. For intense flavor, it’s important to let the mushrooms brown well. Add garlic and allow to cook for another 30 seconds then pour in the cream. Mix well then pour in the milk and cornflour mix. This will thicken the sauce. If you prefer, you can leave out the cornflour mix but you’ll need to cook the sauce down more to thicken which will mean a loss in volume. Season with lemon, salt and pepper and serve. Why did my sauce split? 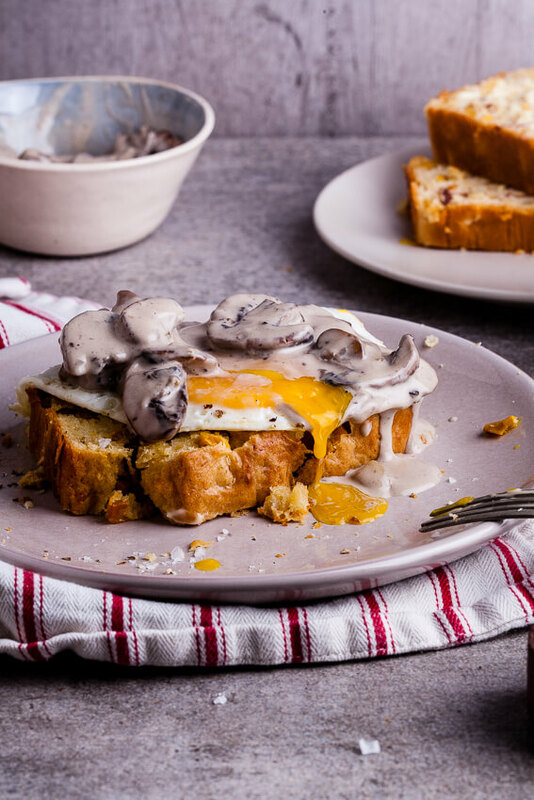 With the use of cornflour in this recipe, your mushroom sauce shouldn’t split as there is starch keeping the water and fat molecules together. A sauce splits when too much water has evaporated and there is nothing for the fat to emulsify with. To save a split sauce, simply whisk in a few tablespoons of water to restore the balance between water and fat. Why is my sauce lumpy? It could be that you didn’t whisk the corn flour and milk well enough before adding it to the sauce. Whisk with a wire whisk until smooth and add a little more stock/water. Why is my sauce pale in color? If you didn’t allow the mushrooms to brown well, the end result will be a paler sauce. There’s nothing wrong with this but if you prefer a more golden sauce, make sure to allow the mushrooms to brown properly before adding the liquid. Also take care not to over-crowd the pan, rather frying the mushrooms in batches. Every cook needs a good easy creamy mushroom sauce recipe. It's perfect stirred through pasta and fantastic on grilled steak. Heat the butter and olive oil together. Add the mushrooms to the pan with the thyme and season with salt and pepper. Allow the mushrooms to fry until golden brown then add the garlic and fry until fragrant. Pour in the cream and milk and allow to simmer gently for 5-10 minutes until the sauce has thickened and cooked through. Season with lemon, salt and pepper and add the parsley. Hi Aliya.. Thanks for explaining the recipe in simple and clear fashion. Also the FAQs are quite helpful too. I have always had great fondness for mushroom sauce with the preference of sauces available at any restaurant for steak. I tried the recipe and it was really yummy!! Thanks again ? I’ve tried this and everyone absolutely loves it!! Thanks! Also wondering how long the mushroom sauce will last when refrigerated? I’m so glad to hear that Janette. The sauce will keep for 3-4 days in the refrigerator. Just make sure to store it in an air-tight container. Wow, it was yum, I made this sauce last night and served it with Woolies chicken schnitzel and it was delicious. Easiest mushroom sauce recipe I have ever tried and I actually scraped the sauce from my plate it was so tasty. Thanks for a great recipe! This sauce has become a staple in our home. We have it on chicken and steak, with pasta. I often add bacon and my kids just love it. That’s wonderful to hear. Added bacon sounds awesome! I became a stay at home mom 6 months ago when my son was born. 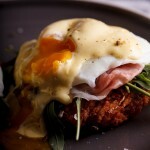 I’ve been looking for new recipes to try out on my hubby and this looks delicious! Trying this out tonight! Delicious! Thanks for your comment! First time making a sauce from scratch… the family loved it. Thank you. So glad you liked it Anita! 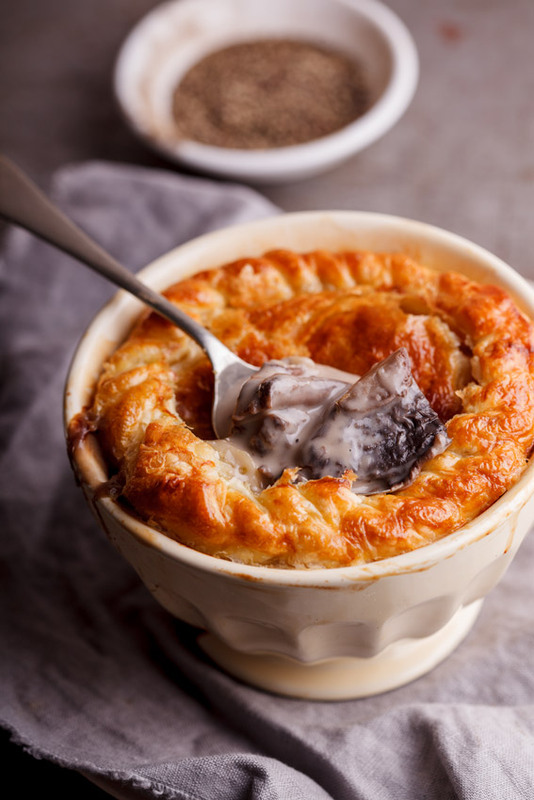 You add the cornflour to the milk and mix well and then you’ll see at step 4 in the recipe, the milk and cream are added to the pan of mushrooms. In South Africa (where I live) corn starch is called corn flour, which is why I mention both names. You want the fine powder variety for this to thicken the sauce. Love this recipe. So simple to make. Will try it out with roasted potatoes and grilled chicken. A bit different from the one I usually make. Thumbs up for this. So happy to hear you loved it. Made the mushroom sauce tonight and it was the best I’ve ever made. Really tasty and ideal with my bacon wrapped chicken. Thanks for such a great recipe. That is fantastic to hear Lin. Thanks so much! Love the idea of that bacon wrapped chicken! What do you normally pair this with? Like chicken and pasta or pork hops and rice? All of the above but mostly I serve it on grilled steak or stir it through cooked pasta for a quick and easy dinner. Perfect mushroom sauce. So creamy and delicious. would it work with out the corn starch? Yup! You just need to let it reduce for slightly longer. You seem like such a talented chef!! What cream do you use for the recipe, and what brand is it? Any whipping/heavy cream will work perfectly well. The directions don’t mention when to add the corn starch . ?? You’ll see in the ingredients list that the cornstarch is mixed into the milk. The milk and cream are added to the sauce together. I’m not sure what you mean, could you elaborate? My family ask for this sauce every time we cook steak. Thanks for a great recipe! I’m so glad you and your family like this recipe Ben! Will this recipe be sufficient for sauce for 9 fillet mignon? Looks amazing! I would make a little bit extra just in case. Maybe 1½ times this recipe? This has become my go-to recipe for mushroom sauce. It’s easy and so tasty. So pleased to hear you like it Lauren! You left out when to add the garlic. I make a very similar sauce with dill. This looks really good. I’m going to make it tonight and pour it over Italian sausage and creamy polenta. How do you think this would turn out with another cup of cream instead of the milk? What ‘cream’ you used to for your sauce ? Made this to try to copy the pizza express mushroom bruschetta – even better, thanks for the recipe!!? I made this sauce last night and served it with Woolies chicken schnitzel and it was delicious. 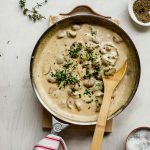 Easiest mushroom sauce recipe I have ever tried and I actually scraped the sauce from my plate it was so tasty. Thanks for a great recipe! I am so glad to hear that Diane! I could dive into this sauce head first. Yum! I am making this tonight to top some pork chops but added finely chopped onion as well. It smells and tastes great! I hope you loved it, love the addition of onion! I could probably eat the sauce by itself. It looks so rich and creamy! I’m not going to lie, I have actually done that and it’s totally delicious. I LOVE mushroom sauce. Yours looks so simple and easy to do. Definitely trying this soon! I hope you love it Nadine! Your favorite meal sounds like it would be my favorite meal too Alida! This mushroom sauce looks amazing and I’m sure it’s pure perfection! My husband Tom would absolutely LOVE this!